Behavioral marketing platform CataBoom and global loyalty and CRM leader Brierley+Partners today announced a strategic partnership that brings new gamification technology with instant rewards in loyalty and CRM programs across the globe. Through this partnership, Brierley+Partners' clients – which include companies such as Hertz, Hilton, Express, GameStop, MoneyGram, Chevron, Hard Rock and others – will be among the first to access new methods of customer acquisition, engagement and retention. CataBoom's solution, which utilizes gamification to reward consumers, will be integrated directly into LoyaltyWare®, Brierley+Partners' proven technology product for loyalty and CRM. As a result, Brierley+Partners will have the ability to customize and personalize games that reward consumers instantly and consistently, while driving engagement and creating brand loyalty. Additionally, CataBoom will be able to integrate Brierley+Partners' robust technology into its own platform so that it can offer CRM and loyalty solutions to its customers. "Traditional marketing companies need to engage consumers in nontraditional ways. Games that reward consumers immediately are an effective way to keep loyal customers coming back for more," said Todd McGee, CEO of CataBoom. "With our technology, brand marketers can launch a new loyalty campaign in seven minutes, rather than seven weeks. Plus, campaigns can be modified and optimized on the fly so customers remain actively engaged throughout the duration of the loyalty program." 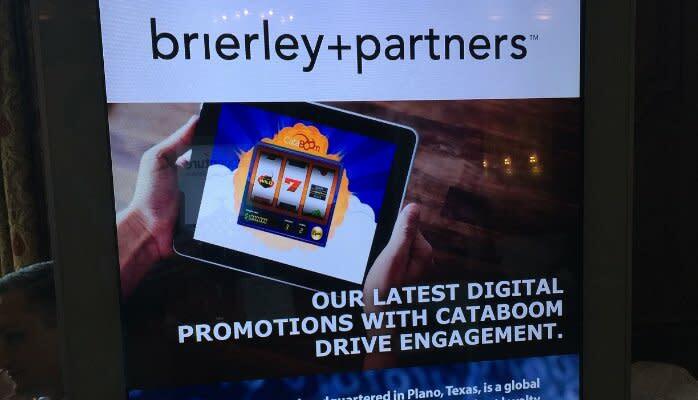 Jim Sturm, President and CEO of Brierley+Partners added, "Partnering with Cataboom offers us an excellent opportunity to provide innovative and personalized gamification techniques that will drive engagement and attract more customers for our clients. Combining the Cataboom gamification solution with Brierley's proven leading loyalty and CRM strategies delivers the most innovative thinking in loyalty program design to our customers."